The Information Difference conducts regular briefings with vendors and based upon these together with additional input from sources such as customers and extensive market knowledge delivers Profiles. These Profiles are available for purchase. The outline of a typical Profile is included below to provide insight into the type of content we are able to offer. This covers general information on the vendor such as when the business was founded, where based, number of employees etc. This includes the number of customers (estimated by our analysts when this is not public knowledge) together with the names of some public ones. 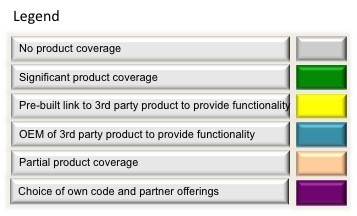 The company’s technology can be mapped to a functionality model as follows (sample only shown). 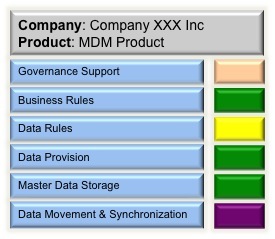 In this example we show the technology model for MDM as an illustration. We have developed similar technology models for both the data quality and data warehousing profiles. They differ in the high level technology components analyzed. This diagram is expanded by a brief discussion of each technology layer. Details of the perceived main competitors. Brief details of both the technology partners who may provide additional technology to extend the vendor offering and Systems Integrator partners recognized by the vendor as able to provide implementation expertise. Examples of use cases deployed at customer sites. Pricing, financing, revenues of company associated with MDM (these are estimated by our analysts if not publicly available). Problems or concerns / weaknesses to consider. 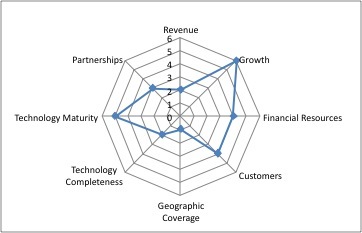 The key aspects of the product are summarized in the following vector diagram. Please note that this is provided only as an example. A brief summary of the above for quick reference. Customer Perspective – A summary in the form of bullet points focused on what to consider and what’s important if you are an existing customer. Prospect Perspective – A summary of what to consider if you are a prospective customer. What questions should you be asking? Competitor Perspective – If you are a competitor what’s important for you to consider. How should you respond in terms of positioning? Systems Integrator Perspective – If you are a systems integrator what is key for you. What points or aspects should you be thinking about as a partner or potential partner. Vendor Perspective – What are the key recommendations for the vendor.